In the summer of 2017, I worked for 12 weeks as a UX Research & Design Intern for Propel, a Brooklyn-based startup that has developed Fresh EBT, a free mobile application that helps over 1 million low-income Americans better track and manage their SNAP (food stamp) benefits. In the summer of 2017, I worked for 12 weeks as a UX Research & Design Intern for Propel, a Brooklyn-based, Andreessen Horowitz-backed startup that has developed Fresh EBT, a free mobile application that helps over 1 million low-income Americans better track and manage their SNAP (food stamp) benefits. 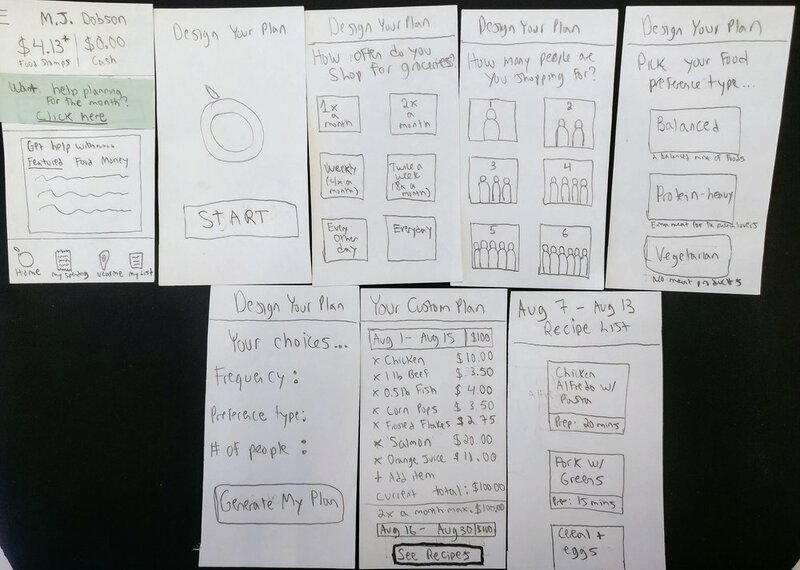 One of the goals of the internship was to research and design a feature to help our users stretch their SNAP benefits. The average SNAP recipient spends 80% of their benefits in the first nine days and by Day 21, the average SNAP recipient has spent their entire food stamp balance. I conducted 18 in-depth interviews and two grocery shopping observations to learn more firsthand about the shopping habits and pain points of our users as they tried to make their food stamp budgets last for the whole month. How do Fresh EBT users currently manage their food stamp benefits? How do Fresh EBT users think about their benefits? With data from my interviews and after conducting two surveys, I found that our users largely fell into two groups, based on on how well they were able to manage their monthly food stamp budget, which I coined "Optimizers" and "Non-Optimizers." 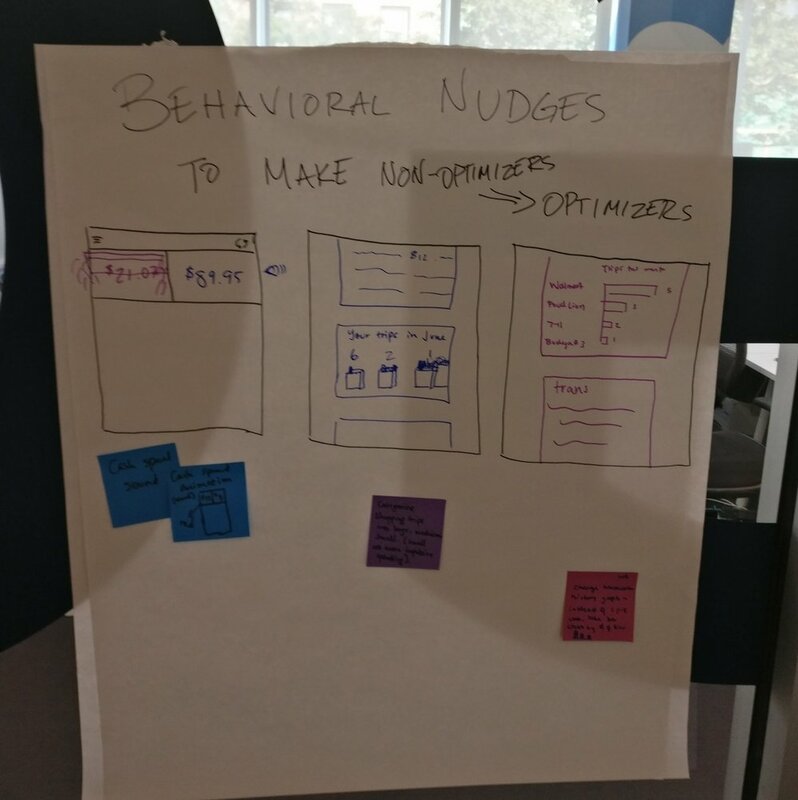 Using the findings from the interviews, observations, and surveys, I worked with Kaela, our lead designer, to create and expand upon our existing personas, settling on five personas that fit into the Optimizers and Non-Optimizer groups. For Non-Optimizers, their food stamp benefits often depleted quickly because of impulse buys, particularly on snacks. 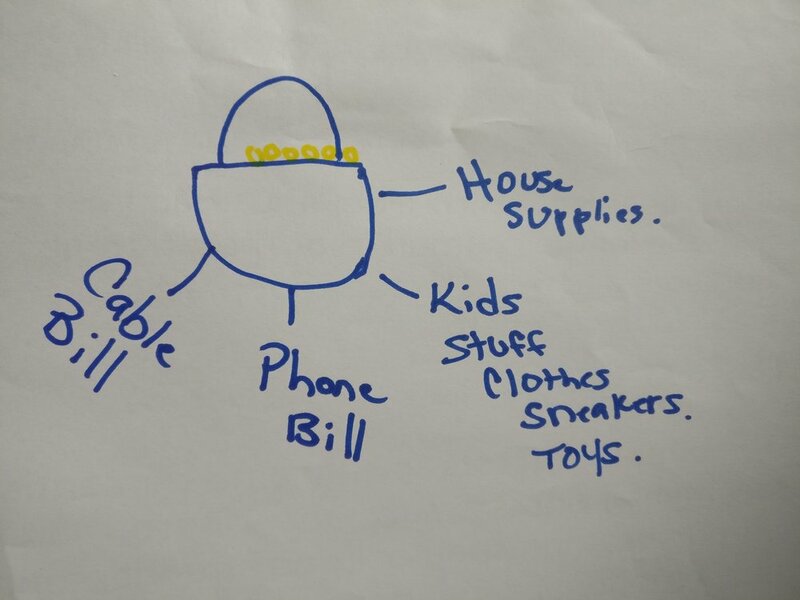 Money Guards - Users used a variety of systems and methods to control impulses and keep distance from “real” money such as giving money to a friend or family member, buying and hiding of money orders, and saving a $5 bill anytime they had one in their hand. Almost all users have friends and/or family members who also receive SNAP benefits. A food stamp budget doesn't typically allow for the most creative of cooking, so many users tire of having the same meal over and over. Auto-Save - Once their benefit deposit hits their account, users opt-in for this feature to save 10% of the funds for the last week of the month. In a time of need, they can transfer these funds back at any time. Snack N' Save - Users stash away $1 every-time they shop at a store that they typically frequent (most users bought snacks at the same store over and over) and thus have money stashed away for the end of the month when funds are low. My Community - Users can see user-generated recipes from other Fresh EBT users and also compare their spending to their friends and others like them. After working with users and showing them these three initial ideas and getting their feedback, it was clear that most users favored the Auto-Save feature. Instead of being anchored to this idea, however, I wanted to take a step back and bring in the rest of the Propel team to come up with new ideas. To do this, I facilitated a team brainstorming session which resulted in three new potential concepts. Using the ideas from the team brainstorm, for speed and efficiency, I made paper prototypes to test with users. These new concepts were tested against the Auto-Save (now Auto-Stash) feature to see which feature would be best to move forward with. Users were given $10 to allocate towards any feature they wanted to be built into the app. Again, overwhelmingly users allocated the most amount of dollars towards Auto-Stash. THE EVOLUTION OF "MY STASH"
The design of the My Stash process was truly an iterative process. Because it pertains to "hiding" away a portion of a user's government benefits (i.e. money), I wanted to eliminate any potential confusion and mitigate the risks of implementing this feature. I conducted seven usability tests of the My Stash feature with a diverse set of our users, ranging from a young woman in her 20s to a older man in his early 60s. I gathered both qualitative feedback through in-app recording of the prototype and a post-test debrief as well as quantitative feedback using the System Usability Scale (SUS). Based off of user feedback, My Stash was a success with a SUS score of 95.0 (out of 100). My goal with My Stash was to utilize the extensive research and iterative designs I conducted to create a feature that would truly help our users stretch their food stamp benefits, allowing them to have food more days out of the month. Despite consistent positive user feedback, our team decided not to implement this feature at this time, but to instead use it in future implementations of other financial products launched by Propel. Because Propel is a private company working in a space that deals directly government benefits, there was some risk and worry that creating a "stash" account could confuse some users. Although my research showed that users found the feature to be straightforward and usable, this looming risk prevented the feature from coming into fruition at this time. As part of my design process, I had to pitch and try to influence my team on how the rewards of the My Stash feature mitigated some of its risks. 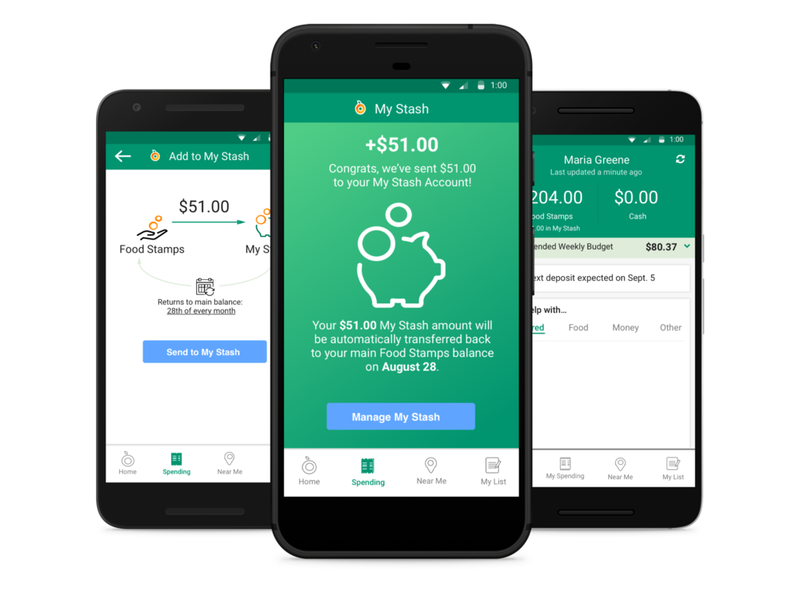 The "My Stash" feature allows users to stash away a portion of their food stamps for when they need it the most: the last week of the month before their next food stamp deposit hits their account. Designing My Stash was a full end-to-end process for me from early user research, to numerous concepts, ideas, and iterations, to in-person usability testing. 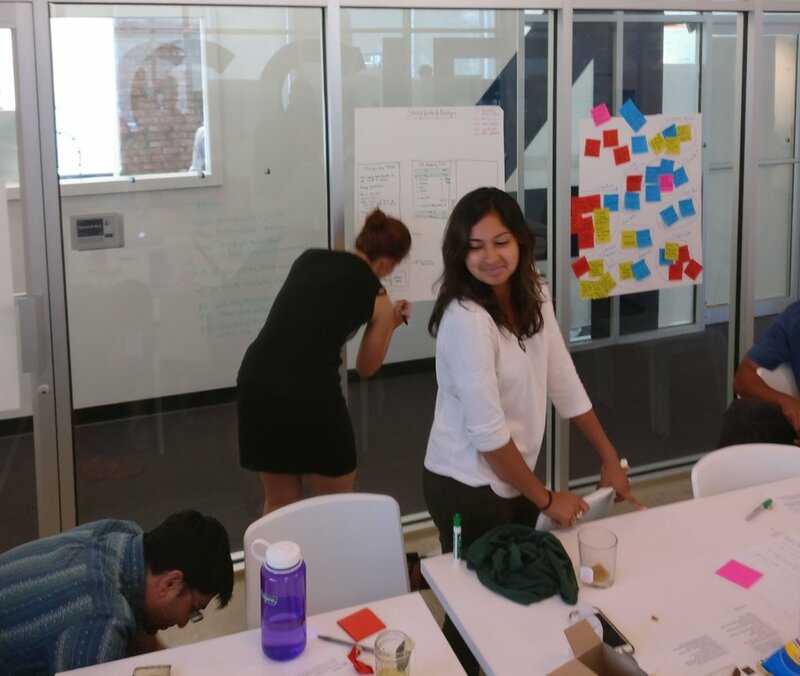 It was a valuable experience for me to apply all that I have learned in my user research and interaction design classes in a real-world setting. Working at Propel also exposed me to designing for underserved populations and the challenges that sometimes arise because of this. And ultimately, because their smartphones were the primary medium for internet access, I found most of our users to be extremely tech savvy and comfortable trying new apps and features to help with their lives. This summer experience represented how, as a designer, you can truly use tech and design for good.